Serves 2; double or triple for larger service. By Dennis W. Viau; modified from a recipe found in a restaurant trade journal. Recipes in restaurant trade journals are often designed to be quickly made in the kitchen. Quicker turnover in a restaurant allows for service to more diners; therefore, more profit. This recipe is no exception. It is quick to make. Season the pork chops on both sides with salt, pepper, and a little ground allspice. Heat the butter in a skillet until hot. (To raise the smoke point, it can be mixed with a little high-temperature oil, such as peanut oil or safflower oil.) Add the pork chops and sauté until well browned on both sides and cooked nearly through. I prefer to use an instant-read meat thermometer and cook to an internal temperature of 135°F (57°C). The meat should be slightly pink inside. Transfer to a platter and cover well to keep warm. Add the sugar snap peas to the skillet. Cook until crisp-tender, 2 to 3 minutes. Transfer to a bowl and wrap to keep warm. Add 2 to 3 tablespoons bourbon to the pan to delgaze it, then add the beef broth mixture to the skillet, bring to a boil, and simmer rapidly over medium-high meat to reduce to a thin glaze. Transfer to a bowl and add the chopped mint. Stir to mix well. Arrange the cooked sugar snap peas on two plates. 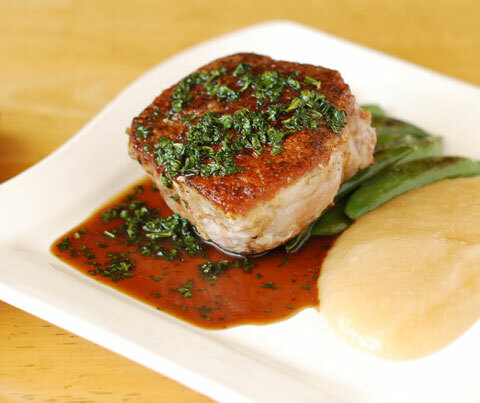 Place a pork chop on the peas, to one side, and garnish with the bourbon glaze. If available, a generous serving of applesauce to one side is a good accompaniment.